(Rendering by Woodbury Corp.) An aerial rendering of Holladay Quarter, a proposed development on the former site of the Cottonwood Mall in Holladay. A grass-roots group has filed a lawsuit trying to reverse the city's decision to reject a petition seeking a special election referendum on redevelopment project. Two Holladay residents have gone to court to overturn the City Council’s rejection of a petition seeking a special election on plans to redevelop the former Cottonwood Mall site. Residents Paul Baker and Stephen Stuart, members of a group called Unite for Holladay, filed a writ in 3rd District Court on Monday. In it, they argue that council members “acted in a legislative manner” in their approval of a high-density housing and retail project, making that decision subject to public review at the ballot box. The writ could lead the controversial project to appear on the November ballot, depending on a judge's ruling. Council members voted Aug. 3 to reject the Unite for Holladay election petition, even though city officials acknowledged it probably had the required 5,874 signatures to qualify for a place on the ballot. The city has argued that its zoning approval was “administrative” and therefore not subject to a public referendum. “We are disappointed that our elected leaders opted to block citizens from voting and forced the issue to be resolved by judges before hearing from Holladay voters,” said Brett Stohlton, an organizer of Unite for Holladay. 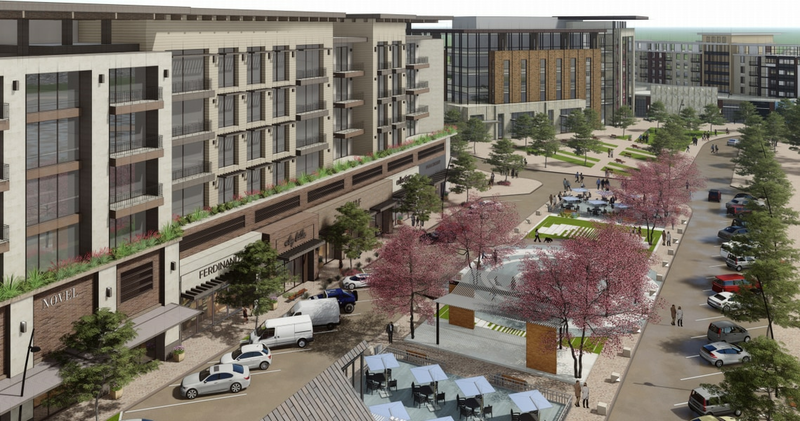 Developers with Utah-based Ivory Homes and Woodbury Corp. are seeking to overhaul the 57-acre former Cottonwood Mall location into “Holladay Quarter,” a complex of retail outlets, restaurants and offices combined with 775 apartments and 210 single-family homes. After nearly seven months of discussions, the council gave final approval to a master plan in May. Opponents say the development is too dense for suburban Holladay and threatens to worsen traffic. Members of Unite for Holladay also criticize how city officials have handled decisions related to land use and tax incentives for the developers. Baker and Stuart say in court documents they would be harmed by the $560 million redevelopment project if it proceeds. The two argue that key decisions on the city master plan for the mall site, tax subsidies and other issues with the project involved “broad policy considerations,” taking the council’s actions beyond purely “administrative” moves. Last week, as city officials unanimously rejected the group’s petition, they also went ahead with scheduling a special election in November. Mayor Rob Dahle said at the time the council’s move — made in the face of likely legal action by Unite for Holladay — sought to accommodate both sides in the dispute and also help ensure the soonest possible vote on the project if the city’s position were overturned in court. “This is something we totally anticipated,” Dahle said Tuesday. “That’s why we called for a special election on Nov. 6, even though our original action was to say this is not petitionable. But the dispute has highlighted frustrations with state law, which appears to require petitioners in such cases to go through a signature-gathering process and submit their petitions before a city can reveal its legal basis for the decisions in question. Petitioners are “forced to spend a great deal of time, money and effort gathering the required number of signatures before the city is permitted to issue a decision on whether the challenged action was administrative or legislative,” wrote officials with the league, which lobbies on behalf of elected officials and civil servants with Utah’s 243 municipalities. While backing Holladay’s interpretation of relevant votes on the former Cottonwood Mall site as “administrative,” the league also called for improvements in the state’s referendum process in light of the city’s travails.